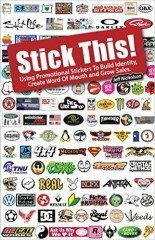 Though there is limited data and, till now, little written about sticker marketing, Jeff Nicholson pulls back the curtain in his guerrilla marketing book and shows how every business and organization can take advantage of promotional stickers in their marketing strategies. 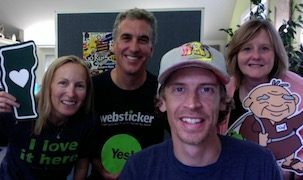 Stickers may very well be one of the best marketing values available and it’s time to reveal the secrets and tips that allow you to use sticker marketing to its maximum effect. Studies show that 90% of word of mouth marketing is taking place off-line. So, what are the best tools to strengthen relationships and encourage conversations? There is no doubt promotional stickers can be a major force. Long before there was Facebook, Twitter, and the hundreds of other social media options – people were liking, tagging, pinning, posting and starting conversations off-line with stickers. Nicholson's Stick This! book will show you exactly how to put this guerrilla marketing weapon to work for you. Marketing with stickers is already being used as a powerful tool by thousands of companies in many different industries. A few powerful examples are highlighted in this guerrilla marketing book. Stick This! book will help stimulate ideas and maximize the effectiveness of a sticker campaign that starts conversations, strengthens customer relations and helps grow your organization. Why stickers? Some quotes from stick this!